I don't think any Pratchett fan will go into this book devoid of emotional attachment and I'm pretty sure that the fact that this is the last ever disc world book will colour my review. That said, what a high note to go out on! This pulls together many of the loose discworld threads and delivers a very satisfying conclusion. In the same way that Raising Steam pulled together a lot of threads from the city/ grand folk side of things, The Shepherd's Crown looks at the smaller but no less important lives of the country folk. Seeing discworld for the last time through the eyes of the witches was the perfect way to go. As well as being a thumping good read, this also gently prods us to look Death in his kindly skeletal face and accept him as part of life, to examine the necessity of being kind as much as you can, of respecting each other and helping each other. Of trying to reach accord with enemies with whom you think you have nothing in common, that you have demonised because they have done monstrous things. Not that this book lectures - like the witches it teaches by example.Tiffany is an excellent character to close on. She's grown up and feels the full weight of her responsibility now. She is unsure of herself and whether she can fill the gap left behind by the death of another character. It is the uncannily accurate portrayal of a young person really committing themselves to the life they have chosen that makes this even more poignant. And of course there are laughs aplenty too because life is afterall very funny, even in its tragic moments. I know everyone has their own Discworld access book - the one that got them in - and their own discworld peak book - after which the writing couldn't get any better, although some feel it suffered. I really became a fan comparatively late. I haven't yet read all the books (maybe 20 or so) and perhaps Pratchett wrote better than this, but I doubt he wrote more wisely. I realise that parts of this book have had the help of the editorial team because he simply couldn't finish it as much as he wanted, and we are told this frankly. 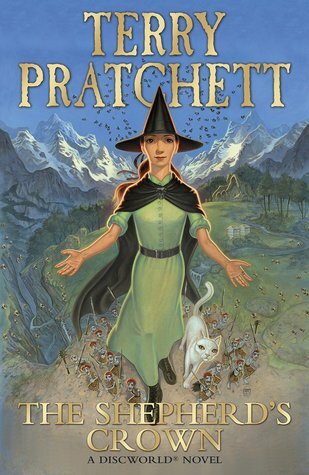 I still think this is one of the best books of Pratchett's I've read. Somehow all the themes I most loved came together here. Highly recommend this whether you are a Pratchett fan or not.